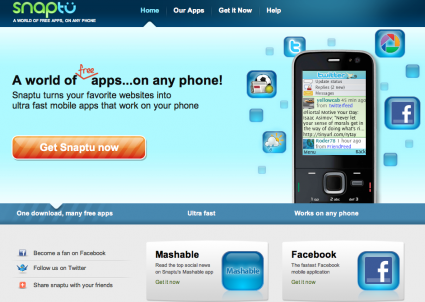 It appears that Facebook has just acquired an Israeli company called Snaptu, an app developer for ‘non smart’ phones, for approx $70 million (it’s first acquisition outside of the US.) The deal is likely to be made official in the next few weeks. Snaptu says that 95% of the global mobile phone market comprises ‘non smart’ or ‘feature’ phones and so it is believed that this deal should enable Facebook to become a lot more social among a much larger group of phone users. The new app is an enhancement to Facebook Zero, an existing product for lower end phones, that is believed to be compatible with 2 500 phone models. Click on SNAPTU home page below for further info about their products. It is still unclear what the other longer term reasons are for this Snaptu acquisition, but in the short term, they’re smart for increasing the Facebook social reach on less than smart phones, that’s for sure.